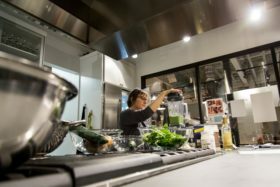 The Easton Public Market Kitchen offers demonstrations, classes, and culinary events featuring local and regional chefs and culinary professionals. The EPM Kitchen program helps connect our guests with the Easton Market District and its offerings, and the broader issues of sustainability as it pertains to food and farming in the Lehigh Valley. Check out the Easton Public Market calendar to see what’s cooking in the EPM Kitchen. Roll up your sleeves, hang out with chefs and culinary pros, and learn how to make spectacular market foods and meals. 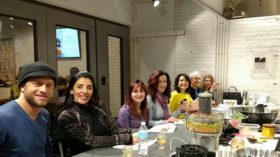 Cooking classes offered at EPM are designed to inspire both new and experienced cooks and everyone in-between. Enroll in a class and learn ways to hone your culinary skills. 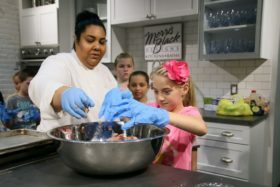 These classes are tailored to each age group and inspire kids as they learn how to understand recipe directions, safe kitchen procedures and healthy eating. Looking to dine out? How about dinner with a locally or regionally renowned chef? The chef’s table at the EPM Kitchen with seating for 8-12 participants, allows everyone to see how the menu is prepared and ask questions of the chef who is creating that evening’s special dinner. It’s a delicious way to learn some chef secrets you can use in your home kitchen! There’s always something delicious happening in the EPM kitchen. Brush up on some basics, tackle something more advanced, or try something totally new. 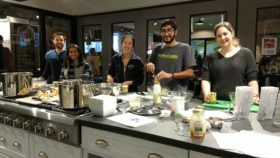 Demonstrations at EPM cover a wide variety of interests like learning how to use seasonal ingredients, beer and wine pairings with food, kitchen knife skills, vegan and vegetarian menus, and even how to make your own kombucha! !